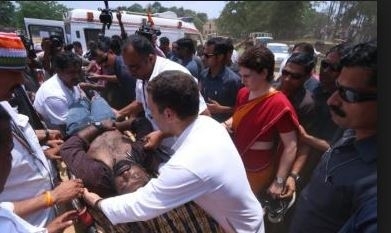 A group of journalist A group of journalists who were injured on Thursday while covering Rahul Gandhi’s election rally in Kerala’s Wayanad were given a helping hand by the Congress chief and his sister Priyanka Gandhi Vadra. The journalists sustained minor injuries after a part of a media vehicle at the Gandhi roadshow broke off. The injured were seen being helped to the ambulance by Rahul Gandhi. One of the journalists fainted, perhaps due to the heat, and fell off the media vehicle.